Motorola has officially taken the wraps off the Moto X – the first phone that has been entirely developed under the supervision of Google. It’s also the company’s first phone in a while to be fully assembled in the USA. 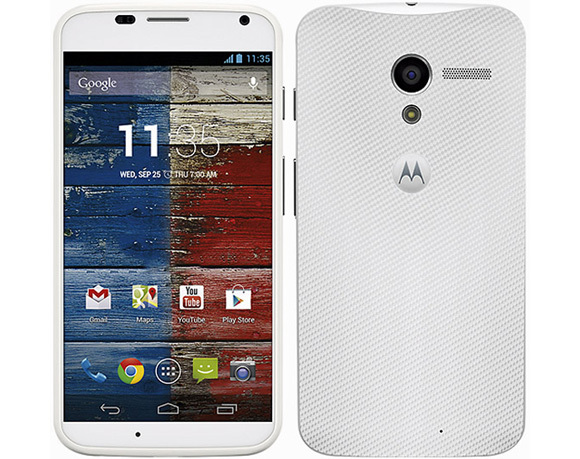 The Motorola Moto X is build around a 4.7″ AMOLED display with full RGB matrix and 720p resolution. This results in a pixel density of 316 ppi. The screen is protected by a new type of Gorilla Glass, which is dubbed Magic Glass due to its curves towards the edges of the phone. On the inside, the Motorola Moto X features a Qualcomm Snapdragon S4 Pro chipset with dual 1.7GHz Krait cores, Adreno 320 GPU and 2GB of RAM. Internal storage is 16GB or 32GB depending on the version you choose but there’s no card slot for further expansion. Just like the latest DROID line-up, the Snapdragon S4 Pro chipset is part of the Motorola X8 board, which also includes a natural language processor and contextual computing processor. The Moto X camera has a 10MP sensor and uses the ClearPixel technology for superior low-light performance. Every other green portion of the Bayer filter array, which sits in front of the image sensor, is replaced by a clear one, allowing more light to reach the sensor. On the software side, the camera offers HDR, burst shots and panorama. The Moto X can also shoot full HD videos at 30fps and there are features like face detection and geo-tagging on board. At the front, there’s a 2MP camera capable of 1080p video recording that serves for video-chatting purposes. Motorola has gone great lengths to make the Moto X a truly customizable phone. Customers can choose whether the front panel to be black or white, as well as the color of the back panel from 18 options. There’s also a third customizable area called accent – it covers the camera rim and side buttons. Further customization includes adding a name or short message on the back of the phone as choosing a Google account and wallpaper to come preinstalled on the device. The Motorola Moto X runs Android 4.2 Jelly Bean, which at first glance looks as clean as stock, but Motorola has added a few touches of its own. One of them is the Active Display feature, which makes use of the OLED screen and brings a snippet of information (the time, new messages and voicemail) on a blank black screen. Think of it as an Android version of Nokia’s Glance Screen feature. Motorola has also preinstalled a transfer app called Migrate. It allows you to transfer your photos, videos, SIM contacts and even call and text history from any Android phone running Android 2.2 or higher. Because of the curved back, the Motorola Moto X thickness varies from 5.6 to 10.4mm. The phone has a pretty decent footprint for its 4.7″ display – 129.3 x 65.3mm with a weight of the very acceptable 130 grams. Below the customizable back panel sits a 2200mAh battery, which Motorola rates at 13 hours of 3G talk time and up to 24 hours of mixed usage endurance. The Motorola Moto X a will be available on the five largest carriers in the USA – AT&T, Verizon, Sprint, T-Mobile and US Cellular. It will cost $200 for the 16GB version and $250 for the 32GB units, both with a two-year contract.